To quickly delete a row in Excel, select a row and use the shortcut CTRL - (minus sign). To quickly delete multiple rows, select multiple rows and use the same shortcut. 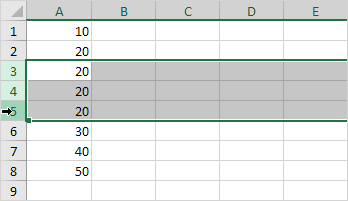 To delete a row in Excel, execute the following steps. 2. Right click, and then click Delete. Note: instead of executing step 2, use the shortcut CTRL - (minus sign). To quickly delete multiple rows in Excel, execute the following steps. 1. Select multiple rows by clicking and dragging over the row headers. 2. Press CTRL - (minus sign). Excel displays the Delete Cells dialog box if you don't select a row or multiple rows before using the shortcut CTRL - (minus sign). 3a. 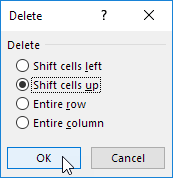 Excel automatically selects "Shift cells up". Click OK.
3b. 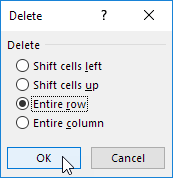 To delete a row, select "Entire row" and click OK.